A few Nanoha/Ace Combat MAD I found in youtube; not exactly NanoFate but they're still nice, I think ! Nice AMV, and welcome aboard ! It's fine to upload stuffs from our site to other places, don't worry about that, there are a lot of our doujins uploaded to Youtube too, as a favor we only ask to keep our credits when people reupload our stuffs. Nice job for a first try ! I have mostly lurked around here for a couple years ^.^ I made this AMV a couple years ago, but until recently the audio was disabled. Youtube finally decided it was alright though so I thought I'd share. Also for anyone who's interested I also did a bit of a Hayate and her Wolkenritter tribute vid as well. Also pretty long with not much flashy editing. A Nanoha and Fate Tribute, which of course, you guys would enjoy. 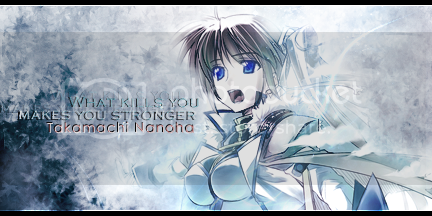 Just so you know, it is my first Nanoha AMV so don't expect anything epic and darn awesome. But I'd have to say it turned out pretty good for a rookie like me. For some reason this video is not loading for me... ? Maybe is a problem with my Internet provider. EDIT: Pick 480p to get the actual timing of the video and the song. I don't know why it got retarded when 360's out of the beat. 720p and 1080p gets all laggy, so don't bother pressing that. I found a amv called "Vivio - I Want a Mom (s)". The uploader says he had it from nanofate.net and I want it in a better resolution. So could some of early members please tell me if they have it? This was one nice AMV that I've almost forgot about. We got this video from Youtube and shared it in the Second MegaPack (you can download it from here). I'm not sure if the quality is higher than the video you linked, but it's in flv in the original quality it was uploaded in 2008. The quality is the same but still thanks for taking the time to reply. Maybe the Creator appears somewhere at sometime again and than I can try asking him. This was one sweet AMV, I loved it. It sure looks like a lot of work was put on it. That video was funny and adorable (specially the end! ), it's the first time I see it I think. Linith, definitely Fate's one and only real mother!!!! This is really something! I liked it a lot. Thank you for sharing. 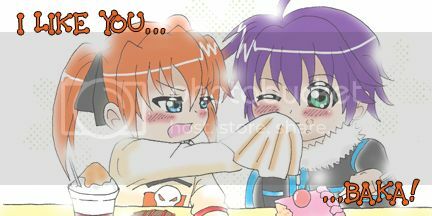 So far, this is one of the best MADs I've ever seen in the Nanoha fandom.